Save the date: Our annual Fall Festival will be Saturday, October 18th. This family-friendly event features hay rides, face painting, activities and a local farmer’s market. Our Pumpkin Pie Bake-Off will return again this year. The best pumpkin pie wins a $50 MD gift card. Visit our Facebook page for more details and updates. Are you looking for a place to grab a coffee, eat lunch or meet a friend in the off season? 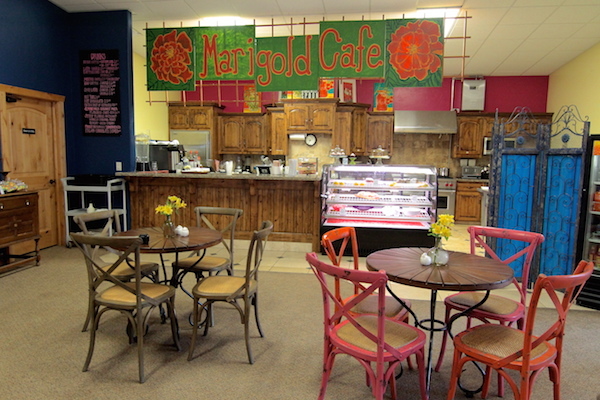 Visit the Marigold Cafe located above our gift shop. Now in its 4th month of operation, the Marigold Café continues to impress our customers and staff with tasty, quality food, coffees and desserts. Along with the menu offerings, our talented chefs create daily lunch specials, pastries and soups with tempting side salads for our deli case. The Marigold Café installed a frozen yogurt machine in August to the delight of all. Try frozen yogurt with our unique toppings or just have it plain. “Fro-Yo” is the perfect ending to a lunch or a special treat with the kids. Our cozy space is a perfect meeting spot or a place to work away from home with free wifi. Fall hours are 9-4 Monday through Saturday. 1) How late in the season can I plant? Until the ground is frozen, usually late October. Trees, shrubs and perennials will continue to grow roots even after the leaves have dropped. Late fall is also the ideal time to spread wildflower seeds. 2) Do I have to cut back my perennials now? Once the foliage is brown, perennials can be cut to the ground. Consider leaving some perennials standing in place for late fall and winter interest. 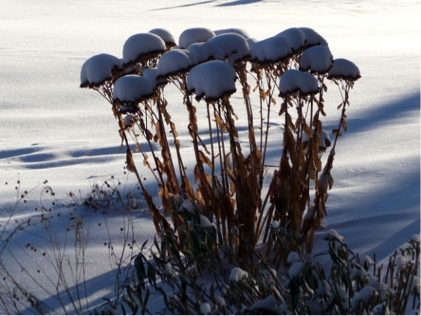 Sedums, coneflower, Russian sage and ornamental grasses can be left standing and look beautiful with a dusting of snow. 3) When should I plant bulbs? Now! 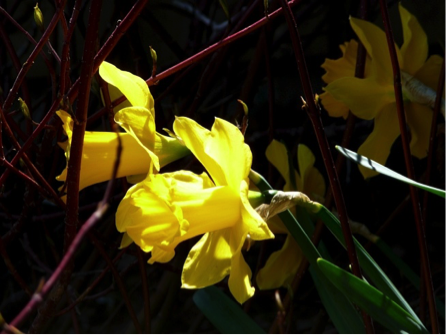 Daffodils, crocus and tulips will wake up your garden with color next spring. Flower bulbs are one of the easiest ways to add color and beauty to any landscape. Plant bulbs once and enjoy the yearly return of color. 4) Do I still have to water my yard? Yes! Although the water requirements are greatly diminished for most plants this time of year, it is very important not to let plant roots get completely dry. Trees and shrubs will need to be kept moist until the ground is frozen. Newly planted evergreen trees are especially prone to drying out and turning brown over winter. Watering deeply in the fall will fill the plant’s water reservoirs enabling them to withstand moisture loss through the winter. Lawns and flower beds will also need water during prolonged dry spells. As a rule, everything should go into winter wet! 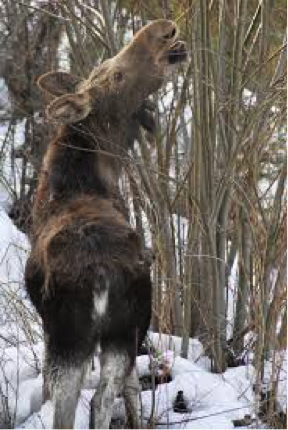 5) How can I protect my lawn and landscaping from voles, moose and deer? For your lawn, plan to mow it shorter than you normally would for its last cut in the fall. This will reduce vole habitat. If possible, mow tall grassy areas near your lawn to reduce vole cover. Apply a repellant like Molemax™ or Repellex™ to your lawn. Protect tree trunks with a hard plastic tree protector to keep voles from nibbling off the bark and girdling the tree. To protect from browsing deer and moose, trees and shrubs can be sprayed with Plantskydd™ plant protector in the late fall. Although these measures don’t guarantee a damage-free landscape, they certainly can reduce the extent of winter damage. << Don’t let this happen to your Jack O Lantern! Wilt Pruf™ is a spray-on anti desiccant. A thin, transparent film acts like a barrier that keeps moisture inside the plant tissues so that they don’t dry out. Use it to protect evergreens from dry winter winds and sun. Apply it in October on any dry day over 50 degrees. In addition to protecting evergreens, Wilt Pruf™ helps keep Christmas Trees, wreaths and garland from drying out so that they stay fresh for longer. 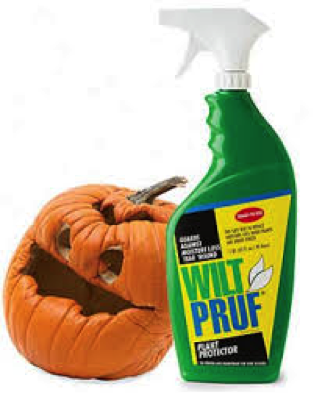 Wilt Pruf™ will also help keep your carved Jack O Lantern from shriveling up. 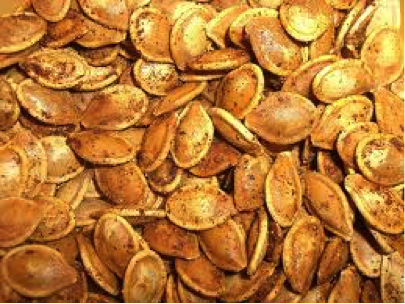 Save the seeds from your carved Jack O Lantern and include your little ones in the making of this healthy snack. Preheat oven to 300. Combine all ingredients in a large bowl and mix until thoroughly combined. Spread mixture onto a parchment-lined baking sheet and bake in for 45-60 minutes, stirring occasionally until brown and crunchy. Preheat oven to 300. Combine all ingredients in a large bowl and mix until thoroughly combined. Spread onto a parchment-lined baking sheet and bake for 45-60 minutes, stirring occasionally until brown and crunchy.